2018was quite the calendar year, with no shortage of Oilers storylines. From Connor McDavid's 2017-18 late-season surge to some key off-season additions making an early impact in the '18-19 campaign, we take a look back at some of the biggest stories from the Oilers Hockey Club in the last 365 days. The second-half surge of Connor McDavid to go from 13 points out of the scoring race at the end of October and tied for 43rd in League scoring to ultimately win the Art Ross Trophy six points clear of second place was an incredible Oilers story for 2018. McDavid was tied for 10th at the NHL All-Star break with 15 goals and 54 points through 49 games, a full 10 points back of Tampa Bay's Nikita Kucherov. In the 33 games after the break, he had 26 goals and 54 points to reach 108 and take the scoring title with 18 points more than Kucherov over that span. The Oilers captain, who also won the Ted Lindsay Award as voted by his peers as the best player in the NHL, became only the second to win the Art Ross Trophy twice by the age of 21. The other? Wayne Gretzky. "That's really special," McDavid stated of joining Gretzky in the achievement. "It's probably one of the (only) things that I've done where I just kind of say, 'wow.'" McDavid's second-half performance made everybody say 'wow.' Projected over an entire season, his 26 goals and 54 points in 33 games would be 64 goals and 134 points. The last time anyone in the NHL had more than 134 points in a season was 1995-96 when Mario Lemieux had 160 and while McDavid didn't achieve it over the full campaign, to sustain it for as long as he did was truly special. Perhaps McDavid's defining moment last season was a game against Kucherov's Lightning. It was game 51 of the season, on February 5, 2018. McDavid scored four goals and added a helper for a five-point night in a big 6-2 win. He vaulted himself from 13th in League scoring to third, narrowing a significant gap on his Tampa Bay target. "This game is all about confidence and how you're feeling out there," McDavid said a day after the game. "At some point, you start feeling good and finding ways to produce." McDavid scored 13 goals and added 8 assists for 21 points in just 14 games in that month of February along with a 22.4% shooting percentage. Unsustainable, right? As March would prove, it was indeed very sustainable as it went at a 24.5% clip that month. Number 97 scored 13 times in 16 games in March and finished with 28 points. On March 24, in a two-goal performance against the Los Angeles Kings, he finally overtook Kucherov for top spot in the scoring race. Kucherov had held onto first since December 12. "I don't really know what it is," he said when asked about his second-half surge. "Maybe a little bit of luck. The team (was) playing better. All of that goes into it. If the team is playing well, individual success happens." Evan Bouchard didn't levitate up an ultralight beam on the American Airlines Center stage when he ceremoniously enrobed in an Oilers sweater as a member of the organization but it did feel as though the Hockey Gods were on Edmonton's side. The Oilers 2018 first-round selection, chosen 10th-overall, was a divine acquisition for a squad seeking a right-shooting, outlet-passing, offensive defenceman at a time when those types of players are heavily sought after and rarely acquired. When Oilers President of Hockey Operations and General Manager Peter Chiarelli found himself speaking into the microphone on the NHL Draft stage with an abundance of right-shooting defenders still available, he knew which would be his chosen one. "There was a need there and there was a lot of defencemen that were available throughout that first round, more than usual," said Chiarelli following Day 1 of the 2018 Draft. "He's one of the guys we coveted." The Oilers President of Hockey Ops and GM detailed the characteristics the Oakville, ON, product wielded not long after making the decision to call his name. The 6-foot-3, 194-pound defenceman received some high praise from Chiarelli. "He's physically big, he's got a very good shot, he's a terrific passer and his hockey sense if terrific," said Chiarelli. "He had a terrific year and he's got a bomb of a shot. We had him really high." As the off-season neared an end and Bouchard made his way to Edmonton to get his first taste of NHL camps and tryouts, the defender did begin to levitate - at times rising as the best player on the ice. Bouchard showed his ability to thread long-distance breakout passes and clap bombs from the point at Oilers Development Camp. When Rookie Camp commenced, it was clear that the 19-year-old was ahead of the curve in his cohort. It was enough to warrant an invite to Oilers Main Camp. He stayed with the Oilers for two months to open the regular season, travelling on the Oilers European trip for the Global Series against the New Jersey Devils. He would suit up in seven National Hockey League games, and wouldn't be re-assigned to the London Knights without getting his first NHL goal puck, achieving it against the defending Stanley Cup champion Washington Capitals. The future Oilers blueliner took the re-assignment in stride. He re-joined his Knights to be their bonafide leader then was named to Team Canada's World Junior roster, where he currently serves as an alternate captain. "Of course, everyone that gets sent down is a little bit upset but you just need to think of the positives," said Bouchard. "I got a few games in and I learned a lot from that experience every day. I know what the coaches expect of me, I know what to work on." A new season brought a new dynamic behind the bench with a blend of experience and potential for the Oilers in 2018. New assistant coaches Glen Gulutzan and Trent Yawney, both former NHL head coaches, brought their wealth of coaching expertise in player management and defence to a new setting in Edmonton. Manny Viveiros, experienced in his own right as a player and a coach in Europe and in the Western Hockey League with the Swift Current Broncos, arrived relatively unproven but has come full circle to coach in his hometown as his first stint in the big leagues. Add in the November appointment of another Edmonton product and the NHL's third-winningest coach all-time in Head Coach Ken Hitchcock, and you've got an entirely different Oilers bench staff this campaign. "We targeted these three individuals for their specific talents, experience and compatible personalities," Oilers President of Hockey Operations and GM Peter Chiarelli said back in May of the assistant appointments. "We talked a lot about the group and not so much on the individuals. We went at this methodically and we were happy to get these three guys." Yawney, who served as an assistant with the Anaheim Ducks for four seasons from 2014-18, had no misunderstandings prior to his move to Edmonton about his role developing an Oilers defensive core that includes the likes Oscar Klefbom, Darnell Nurse, and up-and-coming prospects like Evan Bouchard. "Sometimes all you need is repetition and some refining to get your game in order, so I'm hoping to be able to establish a foundation in all of the defenceman within the parameters of the team, allowing them to be themselves while providing the necessary components needed to compete in the NHL," Yawney said following his hiring. "Obviously the younger guys are starting to hit their stride, so it's exciting to be a part of that." Gulutzan swapped Alberta rivals Calgary for Edmonton to tap into the beat of the Oilers locker room, something that's become a bit of a skill for the Hudson Bay, Saskatchewan coach over his 19 years of professional coaching experience. "I think the players that have played for me would say that is my strength: just being in-tune with the locker room," Gulutzan said. "Knowing whether it's having a day off or whatever the guys need. Just being in rhythm with the team. That's kind of the way I've always coached. "You're never as in-tune with the locker room as the equipment guys or the medical guys (as an assistant coach) but you're probably at the next level. You get a little bit more insight, you get to talk to the guys a little bit more with their guards down. You see how they're doing and feeling." An untapped Viveiros, who won the WHL Championship with the Broncos in 2018 managing a league-best 29.8 percent power play continues to operate making decisions by community alongside his coaching counterparts. "We approach it as a group, we always have," Viveiros said. "The success or the failure of it lies at all of our feet." Oil Country went international in October as the Oilers were selected to participate in the NHL Global Series that included an exhibition game in Cologne, Germany followed by the regular season opener in Gothenburg, Sweden. Following their training camp and standard pre-season schedule that included tune-up games against familiar Pacific Division opponents like Calgary and Vancouver, the Oilers boarded a massive charter jet and flew more than 7,000 kilometres to Cologne for their final exhibition affair against the Deutsche Eishockey Liga's Kölner Haie. Leading up to the game on Oct. 3, the Oilers scheduled several off-ice activities like team dinners, a visit to the city's famous cathedral and a downtown tour that concluded with a boat trip along the Rhine River - all led primarily by Cologne's native son Leon Draisaitl. "I'm pretty emotionally connected to that city," Draisaitl said during an afternoon stroll with his teammates down one of Cologne's many cobblestone streets. That emotional connection was on full display during the team's four days in Germany as Draisaitl and fellow German teammate Tobi Rieder had a chance to catch up with some of their friends from the national program who play for the Kölner Haie. The DEL squad also featured an even deeper tie for Leon as his father Peter is the head coach. The Cologne portion of the Global Series trip reached its culmination with the exhibition match in front of a sold-out crowd of 18,400 at Lanxess Arena - the largest hockey venue outside of North America. Of course, both Draisaitl and Rieder were in Edmonton's starting lineup, and when the announcer finally arrived at the last player on his list, all he had to do was say "Leon…" and the fans replied "DRAISAITL!" in boisterous unison. 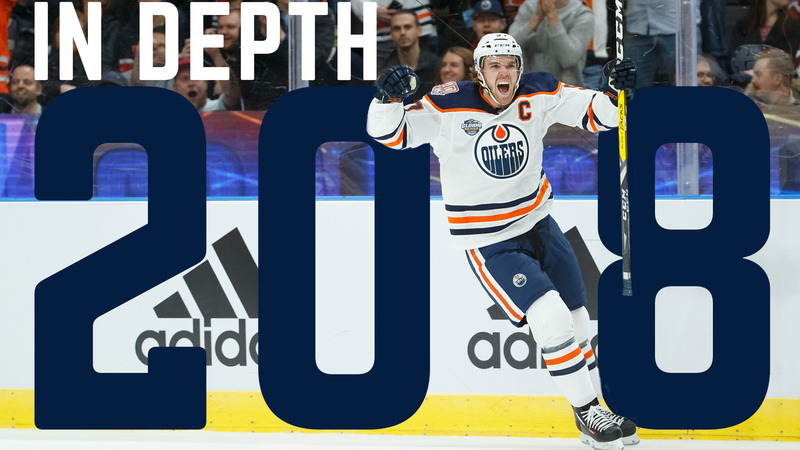 The hair-raising, spine-chilling moment of gratitude towards the hometown hero paved the way for an exciting hockey game as Draisaitl set up Rieder for the opening goal and the Oilers ultimately battled their way to a 4-3 overtime victory. "The fans were unbelievable," said Oilers captain Connor McDavid, reflecting on the ever-present chanting, singing and cheering from the capacity assortment of locals and tourists. With some valuable team bonding and one last pre-season win in the books, the Oilers flew north to Gothenburg to begin preparations for the real deal - their first game of the 2018-19 campaign against the New Jersey Devils on Oct. 6. Draisaitl and Rieder were the go-to guys in Cologne, but the attention shifted to a pair of Swedish blueliners as Oscar Klefbom and Adam Larsson had the unique opportunity to show their teammates around the second-largest city in their home country. The trip home provided the Swedes with an opportunity to reflect on their childhoods and how their dreams of playing in the NHL developed much later in life than those of present-day young hockey players in their homeland who have on-demand access to the game's grandest stage thanks to social media. "When you're a kid, you're kind of looking up to the local hockey players," said Larsson, who grew up in Skellefteå in northern Sweden. "The NHL is getting more popular over here the last couple of years. Nowadays, it's so much easier to watch highlights and games." Another healthy mix of more than 12,000 hockey fans from near and far packed Gothenburg's Scandinavium for Saturday's main even as the Oilers and Devils looked to open their respective seasons on a positive note. A power-play goal from Milan Lucic drew the Oilers even with the Devils `1-1 through 20 minutes, but New Jersey scored twice more in the second and third periods to claim a 5-2 victory, with Draisaitl delivering Edmonton's other tally. "I would have liked to have won this one," said Klefbom, who had many friends and family members in attendance from his nearby hometown of Karlstad. "It's really special for me and Larss, obviously." Looking back on the week in Europe, the Oilers certainly would have preferred to secure a victory in the season opener; however, they still played a meaningful role in the growth of the NHL on the world stage. As NHL Deputy Commissioner Bill Daly said during the Global Series, "the buzz that a National Hockey League team and a National Hockey League game can create can do a lot for the sport". This past off-season saw the Oilers make a couple key additions to bolster their roster heading into the new campaign. As the 2018 calendar year draws to a close, we take a closer look at two of those acquisitions that have shone particularly bright for the Oilers in the front half of the season. The first of which came in the form of a free-agent signing on May 1 when the Oilers agreed to terms with Finnish goaltender Mikko Koskinen on a one-year deal. It's no doubt the Oilers were taking a leap of faith on the 29-year-old KHL all-star netminder that had yet to prove himself at the NHL level. Drafted 31st overall in 2009 by the New York Islanders, Koskinen made just four NHL starts on the Island before returning to Europe. After solidifying his status overseas over the past seven years, he felt he was ready to make the jump back over the pond. The 6-foot-7 Euro was brought in to not only help lighten starter Cam Talbot's heavy workload but to create some crease competition and hopefully challenge for more than the conventional 20-25 starts most NHL backups get. It's been so far, so good for the soft-spoken Finn, who, in his first 19 starts for the Oilers, has compiled an 11-6-1 record including three shutouts in just his first seven starts on Rogers Place ice. While his future remains unknown at the moment while in the midst of a one-year contract, the Oilers can be satisfied in knowing that the NHL potential they saw in Koskinen has paid dividends to start 2018-19. With the Oilers off-season activity starting with Koskinen's signing, it more-or-less ended with the signing of forward Alex Chiasson to a one-year deal on October 3 after he attended training camp on a professional tryout basis. After a whirlwind off-season that started after he captured the Stanley Cup with the Washington Capitals in June, Chiasson found himself in familiar, albeit uncomfortable, territory when he was left without a contract after the Caps decided to part ways with the veteran winger after their Cup run. His one-year stint in Washington was also the result of a professional tryout opportunity (PTO). After fielding interest from a couple different clubs over the summer, Chiasson weighed and measured his options and ultimately decided on a PTO in Edmonton, stating he felt he fit best amongst their existing forward group. The Oilers knew what they were getting in Chiasson after he earned a contract out of training camp-A gritty, veteran depth forward who had the ability to chip in offensively around the blue paint and was heralded by current Oilers assistant coach Glen Gulutzan, and former coach of Chiasson's in Dallas and Calgary, as a guy who "does everything right" and "knows how to win". What the club didn't know was that after sitting out the first five games as a healthy scratch, Chiasson would burst out of the gates with a two-goal performance vs. Pittsburgh in just his second appearance and refused to look back. In his first 31 games in an Oilers uniform, he has tallied 16 goals and 4 assists-already zooming past his career-high total in goals when he recorded 13 in 79 games for Dallas in 2013-14. Chiasson has flashed his work ethic along with an ability to consistently finish close to the net as he makes his case for one of the most pleasant surprises of the Oilers season through the first half of 2018-19. Each and every second Sunday during the season we dig deeper into Oilers storylines with our long-form features.